May 17, 2015 / Heidi B. A week of tension and teases built up to the Saturday night premiere of episode 115, Wentworth Prison….and we were NOT disappointed. The episode lived up to viewer expectations while remaining almost entirely faithful to the book. From the opening credits, which ends with a variety of torture devices hanging on chains (hello! creepy eye holes in the iron mask), to the ending frame of Claire looking hopeful at the possible plan to rescue Jamie; viewers were kept constantly on the edge of their seats. The true sadist nature of Black Jack Randall is examined further during this episode. 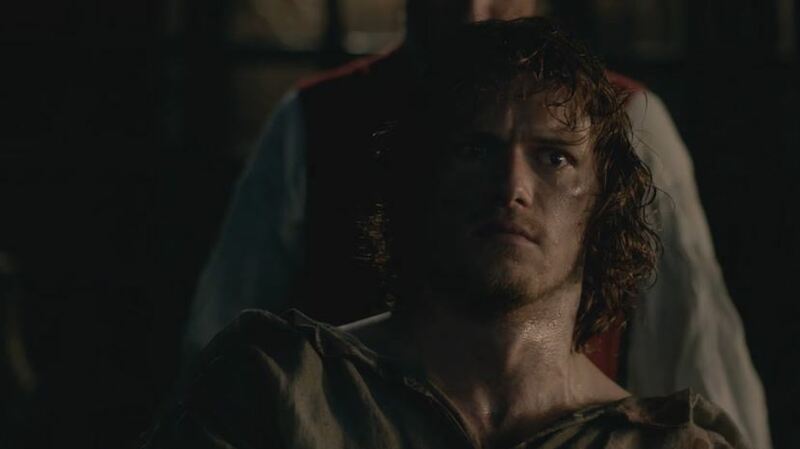 Viewers are led to believe that Jack might actually be rescuing Jamie from the gallows, but that is just the beginning of his plan to psychologically and physically torture Jamie. You see, this is an episode about surrender. Jamie’s forced surrender to Jack to save Claire from death, Jack’s surrender to his sadistic side, and Claire’s surrender to the love she feels for Jamie. It’s these three stories of surrender, and ultimately love, that show the depth of the characters and move the story forward. Many were shocked at the graphic depictions of torture, but in my opinion, although they were gruesome, the psychological torture inflicted on Jamie seemed far worse. From being brutally beaten and maimed, to being soothed and then “rewarded” for his submissive behavior, Sam’s Jamie shows every emotion on his face. It was at the 45 minute mark, that I found myself clutching my face crying at the man who was attempting to comfort his wife as his own hand was being nailed to a table. Emmy winning acting, indeed! I’m glad you found us! If you’re on Facebook or Twitter, find us there, too. I stumbled on this website. That was very beautiful tribute to Diana Galbadon. It is amazing how much this story really does change your life. It gives you a whole new way to look at things. The world is definitely a better place as a result of this book and what it inspires the reader to do in their own life. Thanks for sharing! If that episode doesn’t garner them Emmy noms, I’ll be really disappointed. Excellent recap — you captured my feelings exactly!! Very hard to watch, but true to the book. Sam does an amazing job with some very difficult material!! Beautiful observation and very well stated. The last sentence of your recap sums it all up for me! Incredible moment. Perfectly stated!! It was brilliant! !